The Regina Planning Commission is recommending a plot of land in The Creeks neighbourhood be named Okimasis Park at its meeting on Thursday to honour Cree language expert Jean Okimasis. A Regina City Council committee wants a new city park be named after Cree language expert Jean Okimasis. 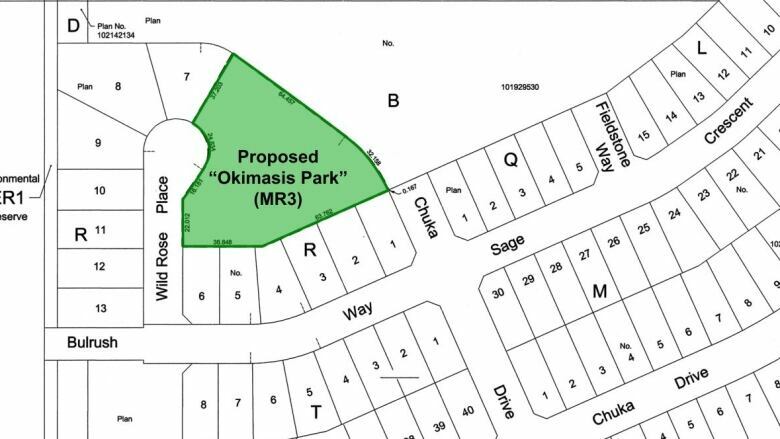 The Regina Planning Commission will recommend a plot of land in The Creeks neighbourhood in the southeast edge of the city be named Okimasis Park at its meeting on Thursday. Jean Okimasis was born on the White Bear First Nation in 1938. She is known for her work teaching and preserving the Cree language in Saskatchewan. She was a Cree language instructor and curriculum designer at the Saskatchewan Indian Federated College (SIFC) in Regina. Her work with SIFC led to the development of "Indian languages" as a full department in what would eventually become the First Nations University of Canada. Her work led to her receiving the YWCA Woman of Distinction Award in 2000 and an honourary doctorate from the University of Regina in 2005. Karina Developments Ltd, the builder of the park, requested the name to honour Okimasis. The proposed name is already on the list of names approved by the Civic Naming Committee. Traditionally, when naming parks, the commission seeks multiple name options from the community, but has chosen to fast track the request because of the name's strong alignment to the objectives of the Regina Cultural Plan to "ensure that the naming of streets, parks and other civic assets is done to celebrate Regina's unique history of cultural diversity and that tells the whole story of Regina." The commission will recommend at its meeting on Thursday that the name request be sent to the City Council meeting in August for approval.